How do you count elephants in the jungles of Africa? You can either collect their excrement or you can listen. No, seriously. 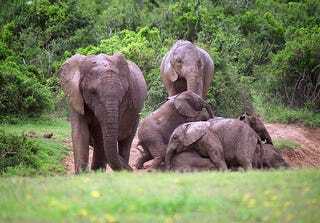 The Elephant Listening Project at Cornell University has figured out how to count elephants using acoustic monitoring. Rather than wasting time, funds, and personnel in attempts to canvas entire jungles for an elephant census, researchers are simply setting up microphones. This bioacoustic monitoring technique is similar to what has been used in the past, on a smaller scale, to count birds, but in this case it's covering hundreds of square miles.